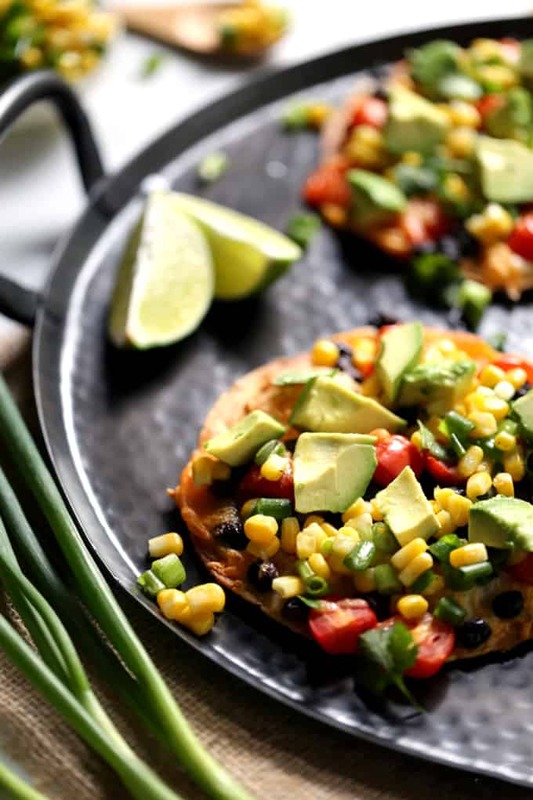 Dinner is just 20 minutes away with these bright and flavorful Black Bean Tostadas with Corn Relish. Perfect for Meatless Monday or any day you’re short on time, this recipe is easily customized and can be prepped ahead to get dinner on the table in a flash. Say “Adios!” to Taco Tuesday and instead usher in the reign of Tostada Tuesday! 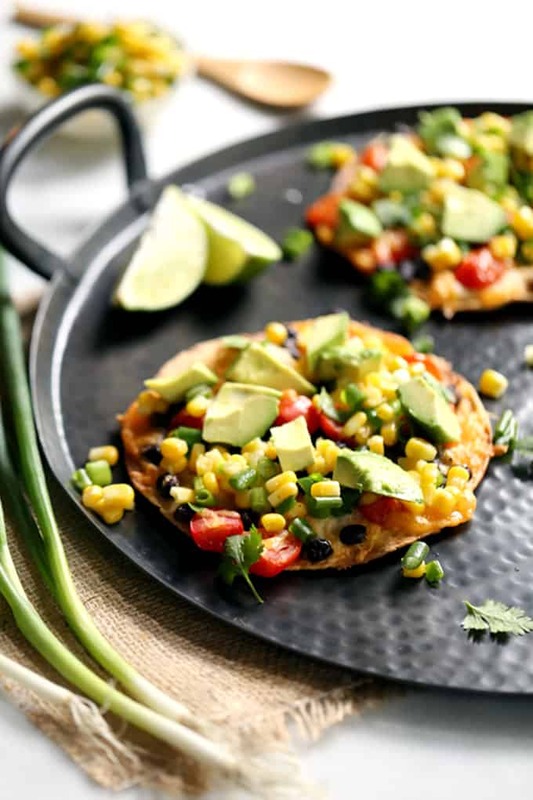 Why not really shake things up and serve these Black Bean Tostadas with Corn Relish on a Meatless Monday, too? That’s what usually happens in our house. We try to eat meatless one day of the week and usually it’s Monday. I love that these tostadas can be prepped ahead, are easy to customize to the tastes of each person in our family and in general just make life easier when the beginning of the week tends to be insanely chaotic. Small flour tortillas are sprinkled with black beans and cherry tomatoes before being showered with cheese. I say the more cheese the better and that earns me major mama bonus points in our house! 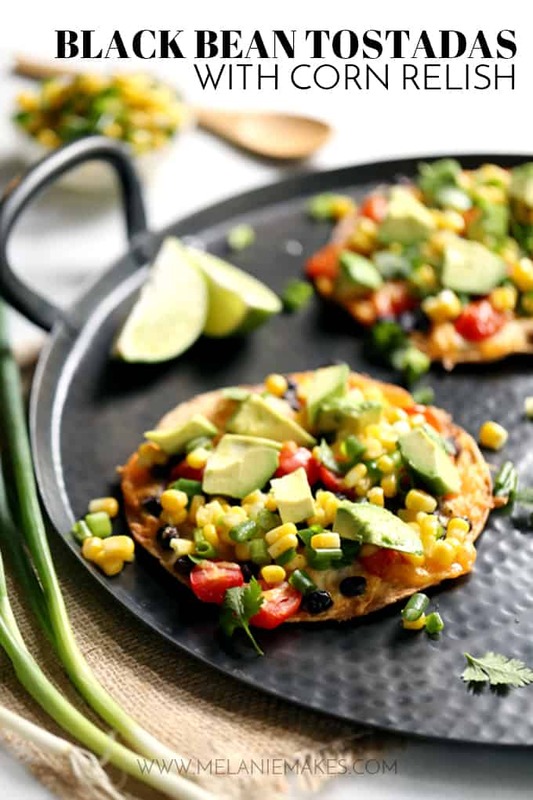 The bedazzled tortillas are then slid into the oven for a few minutes before being topped with a cool corn and green onion relish and – my favorite part! – large pieces of avocado. Sure, they could be diced small or you could even skip them as my older daughter insists – gasp! – but seriously, I could put an entire avocado on a single tostada and think life couldn’t get any better. And honestly, I may have done just that a few times in the past. Just a few! Feeling pressed for time? Prep the ingredients the night before or earlier in the day! 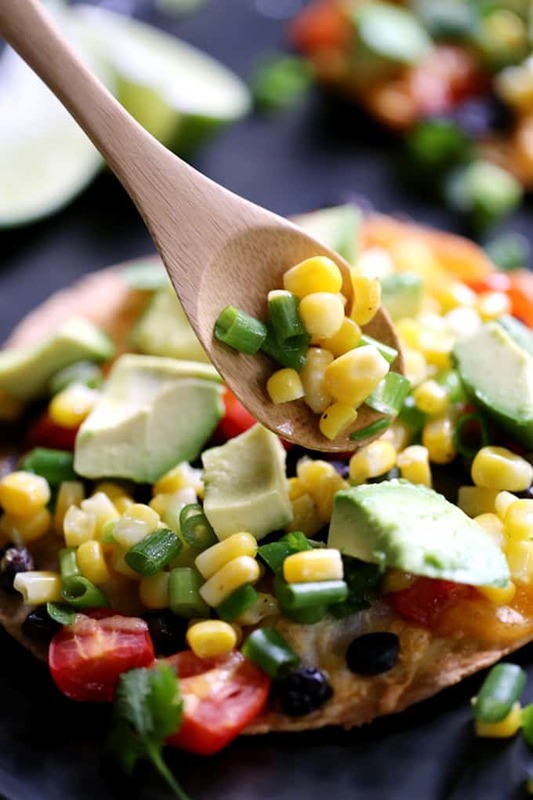 Slicing the tomatoes, rinsing the black beans and stirring together the corn relish means that ingredients simply need to be pulled from the fridge and you’re ready to begin tostada assembly! 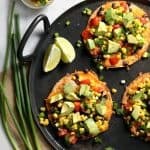 Even though these Black Bean Tostadas with Corn Relish are meatless, that doesn’t mean you’ll leave the table feeling hungry. No sir! The black beans are a quick and easy addition of protein. The do the same for my Huevos Rancheros Sheet Pan Nachos, Southwest Carrot and Black Bean Soup and Orzo and Black Bean Salad. As my pantry is always stocked with black beans, it’s nice to have recipes like these Turkey Black Bean Enchilada Bake, Chicken, Black Bean, Avocado, and Radish Salad with Lime and Cilantro and Black Bean Pomegranate and Avocado Salsa in my back pocket to try next. Thinly slice green onions and add to medium bowl along with corn. Add 2 tablespoons olive oil and juice of one lime. Season with salt and pepper. Halve tomatoes and place in small bowl. Arrange tortillas on two parchment or silicone baking mat lined baking sheets. Brush both sides of each tortilla with remaining oil. Rinse and drain beans and sprinkle over tortillas. Top with tomatoes and cheese. Bake until golden, 8-10 minutes. While tostadas are baking, peel, pit and dice avocados. Juice remaining lime and add to corn relish to taste. You can also drizzle any remaining juice over avocados to prevent browning. Before serving, top tostadas with corn relish and avocado. Oh my goodness! I love these for lunch! I made this on Tuesday and it was a huge hit with my family! Thank you for bringing this to our table. Thrilled you enjoyed them, Jacque! These look amazing! So fresh and flavorful! I love all these ingredients and I am sure I will love this dish! These were super easy to make and they were so delicious, thanks! Those look so tasty....perfect for a busy family dinner. Yummy! This is the perfect quick and easy weeknight meal! These look like a fantastic vegetarian dish!! What an incredible weeknight dinner!! Looks fantastic! These look like the perfect fiesta for my mouth. Plenty of great colors and flavors! These look so delicious! Love all those veggie toppings...yum! Thanks so much, Brandy - such a great way to get in lots of veggies! I always get super excited when I stop by your blog, Melanie! I seriously want to make EVERYTHING THAT YOU POST! Ahhh! These tostadas are right up my alley. Pinned! You totally made my day, Justine - thank you so much! Ooh yes please! Tostado Tuesday should be the new thing! Thank you for your kind words, Andi! Melanie these look so amazing!!! These are such a wonderful idea! Meatless, so nutritious, and just bursting with great flavors! Absolutely my kind of meal! And I especially appreciate how really quick and easy they are - just perfect for busy nights - and how adaptable with so many possibilities to keep the whole family happy! So great! You're so incredibly kind, Shelley - thank you! Excuse me, but will you PLEASE come cook for me? This looks amazing!